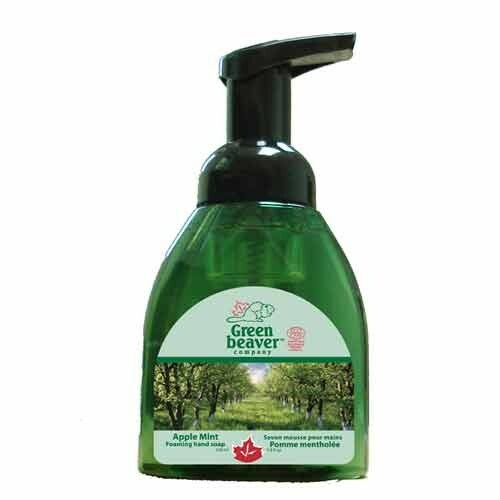 Up for the month of March – Liquid Hand Soap!! I don’t know about anyone else but I find with two small kids around the house I am constantly hand washing. I just picked up the hand soap from our kitchen and here’s what’s inside: Sodium Laureth Sulfate, PEG-120, PEG-7, PEG-40, Parfum (?? ), triclosan and some other unpronounceable stuff. Further compounding all the chemicals in liquid hand soap is the fact that practically all hand soaps on the market are now ANTIBACTERIAL. Overusing antibacterial products makes antibiotics LESS effective when we really need them. Studies have shown that proper handwashing with a regular soap is effective for keeping hands germ free. 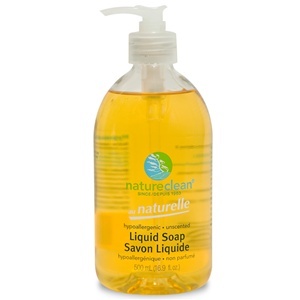 Nature Clean Unscented Liquid Hand Soap. This product is $6.49 for 1 litre. It looks like they make the Treehouse soap products for kids, so we’ll probably invest in some of that! 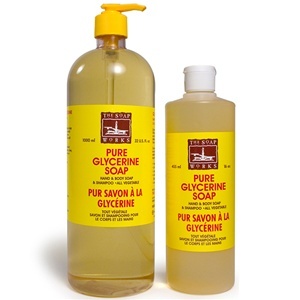 The Soap Works Liquid Glycerine Soap. This product is $13.99 for 1 litre. ← Where did this all come from?